The best mechanics tool set will have more than just sockets and wrenches and is a great starting point to a household tool set. It will include drivers, sockets, wrenches, and a variety of other tools needed for most common applications. For convenience and simplicity, a quality tool set should include multiple size ratchet drivers with both metric and SAE socket sizes. No matter what type of mechanical job you have, the right tool for the job will make it faster and easier. The key is to find the right combination of usefulness and portability, which is what these sets bring to the table. If you need a set of tools for medium to heavy use, plan on spending a little more for a set from DeWalt. DeWalt tools are designed for professional use, but priced to appeal to the weekend mechanic. Spending less does not always mean getting less, though, and every mechanic will appreciate the quality and durability of both tool lines. Add one of the best tool brands for the money (Stanley) and any one of these sets would be a nice addition to your own garage. NOTE: If you’d rather buy your tools individually or already have some of the tools included in these “all-in-one” tool sets, a dedicated socket set might be a better option. For more than 100 years, Crescent has been an industry standard for mechanical tools and they feature the company’s trademark Crescent Wrench. The Crescent Tool Set CTK170CMP2, a 170 piece solution for most mechanical needs, is no exception to the rule. You will enjoy the smooth chrome finish, flawless operation and superior balance, all indications of superior workmanship and quality. Crescent tools include a limited lifetime replacement warranty that covers any manufacturing defects but doesn’t quite match the excellent warranties from the likes of DeWalt or Stanley. However, the design quality equates to having fewer replacement needs. 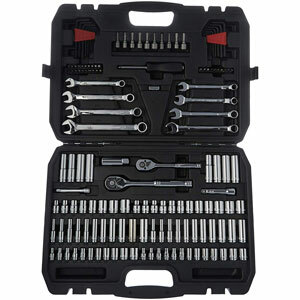 Tool set CTK170CMP2 includes a wide variety of sockets. All 3 common ratchet sizes are provided, using both 6 and 12 point sockets up to 7/8 inch SAE and 21mm metric. For getting into close spaces, 3, 5 and 6 inch extensions are included, and the quick release ratchets will save you time when you have to alternate between multiple sizes. Spark plug sockets for 5/8 and 13/16 plugs match your most common deep well needs. Having the right tool for the job is important, and Crescent tools meet ANSI and ASME specifications. More than a bragging point, this fact means that you will have less stripping and slipping when removing rusty nuts, as happens with cheaply made tools that have little or no quality control. While not professional quality, this Crescent set is considered by many to be the best mechanics set for the money. Known more for their popular power tools, DeWalt has introduced this excellent, high-quality mechanics set at a very reasonable price. 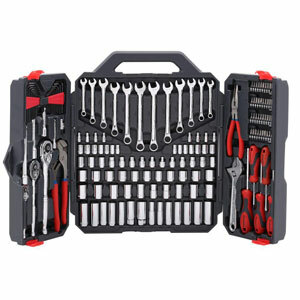 This 205-piece set (also available in 84, 172, and 247 piece variations) includes a variety of tools to take on most mechanic related tasks you throw at it. The 72-tooth ratchets are solid, just the right size, and have a low 5-degree arc to allow them to be used in the tightest spots. The 6-point sockets cover 99% of the socket sizes you’ll need and everything is in fully polished chrome that not only looks great, but offers excellent corrosion resistance. 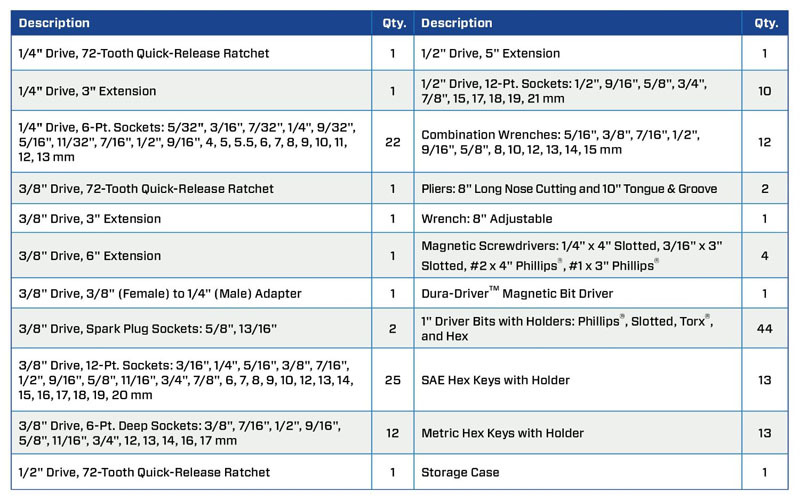 Also included are extension bars, spark plug sockets, adapters, 10 combination wrenches in the most common sizes, hex keys, and an anti-slip screwdriver with an assortment of bits. Holding everything together is a durable blow mold case with metal latches (as opposed to the less secure plastic latches found on most cases). Topping everything off is DeWalt’s lifetime guarantee which offers free replacement. Probably the most common issue with this set actually involves the case. Some users have found that a few of the tools (namely sockets) don’t stay in place after closing. For most, this will not be an issue but it’s something to consider if you’ll be moving the case around a lot. It’s unfortunate as the tools themselves matchup well to sets costing 2-3 times as much. All in all, DeWalt is a brand with a great reputation and this set offers excellent bang for the buck. One of the trademarks of the Stanley tool family is the lifetime replacement warranty. If you break or damage a wrench in either this set or the one below, it will be replaced free of charge at any authorized Stanley distributor. You can feel the difference when you are using a Stanley tool, and manufacturing specifications meet or exceed ANSI standards. 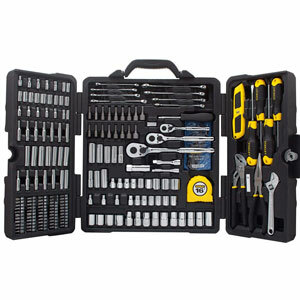 The popular STMT73795 tool set includes 201 pieces (a 170-piece version is also available) and is a fantastic starter set for a household. 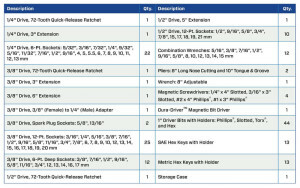 Included in the set are your standard common sizes of ratchets, sockets, combination wrenches, and hex keys. But you’ll also get tools such as screwdrivers, pliers (groove joint and needle nose), tape measure, adjustable wrench, utility knife, and various drive bits. If you don’t yet have a tool chest or simply don’t have room for one, this Stanley tool set will have you covered on most auto and home maintenance and repair tasks. The ratchets are made from forged chrome vanadium for strength and durability and the full polish chrome finish on the sockets and 8 wrench sizes is on par with other brands. The ratchets themselves are pretty decent but not buttery smooth like the Crescent or DeWalt above. Every tool has its spot in the tri-fold case but once again, the case is a slight weakness. Some of the pieces are a bit hard to remove and others are a bit too loose. We like the set as an overall good value and it would make for great “first time homeowner” tool set but for serious usage, one of the two sets above would be better picks. 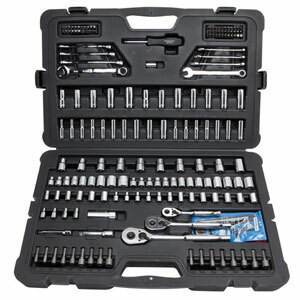 For those who are looking for a good budget mechanic’s set, this 145-piece set Amazon-branded set is good option. AmazonBasics is more known for their popular low-cost home electronic accessories and household items but they’ve now branched out to other areas which will almost certainly be a hit as well. Like other sets on this page, the tool bodies of made of forged chrome-vanadium steel and coated with a polished chrome finish for durability. You’ll get all the most popular socket sizes (all 6-point) in both 1/4 and 3/8-inch drives, 8 combination wrenches, and various bits and accessories. The two pear-shaped head ratchets have no slop or slippage which is surprising in an economy set like this. The molded case once again is the weak point. Don’t expect all the sockets to stay in place when moving. But for a good beginner’s tool set, you can definitely do much worse than the AmazonBasics set. The STMT71654 tool kit includes most of the fastener-related tools you will need. Instead of providing you with a wide assortment of tool types (like the other Stanley set above), this set focuses on sockets, drivers, and wrenches. This limits what you can do with the kit, but increases the number of sizes you have available. The molded case hold sockets and driver tips in place, and is designed to be portable and easy to pack away when you’re done. The ergonomic tool design is nice if you spend a lot of time working with your tools because they reduce finger-cramping and increase your leverage. If the cost is a major consideration, Stanley is one of the most economic tools on the market. One problem with this tool set is that it does not include 3/4 or 7/8 inch sockets, which are commonly needed for auto work. These are unusual omissions for a mechanical tool set, and supplemental socket sizes are available separately, but will not store inside the plastic case. Tip for others… don’t just go to Walmart or Autozone to get the cheapest boxed tool set that you see. Took all of 2 weeks for the ratchet to stop working and chrome to start flaking off a couple of the sockets. 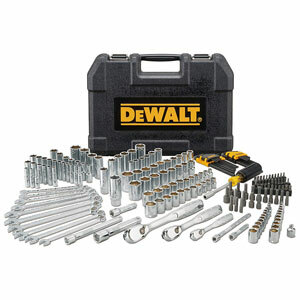 Just ordered the DeWalt set and looking forward to trying it out.